Over thirty recent movies are still available to rent for a dime, as well as more than two dozen top albums. 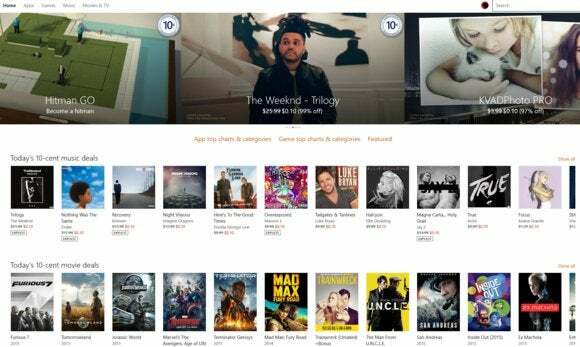 Microsoft is offering one more day for Windows owners to capitalize on its 10-cent deals on apps, albums, and movie rentals, with virtually all of its deals still available. Microsoft’s “bonus day” of deals features HD rentals of Furious 7, Tomorrowland, and the ubiquitous Frozen, in addition to the option to buy The Weeknd’s Trilogy, Imagine Dragons’ Night Visions, and Drake’s Nothing Was the Same albums for a dime apiece. Why this matters: Most customers don’t often think of Microsoft as a source of music, movies, and games, even though the company offers its Groove Music service and its Movies & TV app. But the deals have paid off in a big way, Microsoft said in a blog post: Since the promotion kicked off 10 days ago, the company has seen a tenfold increase in customers who have made a purchase, and a 29-fold increase in overall purchases of apps, music, games and, movies. Perhaps most importantly, 75 percent of those who purchased a deal had never shopped in the Windows Store before. Within the Store app, however, you’ll probably still need to select the “Music” tab and then scroll down to find the 10-cent albums, though, which include Jay Z’s Magna Carta...Holy Grail, Avicii’s True, Eminem’s Recovery, and more. Note that several of these albums were offered for free as part of last year’s massive free album deal. And while many apps are available for just a dime, the lack of Windows apps means that Microsoft’s running repeats of deals it promoted earlier, such as Hitman: Go. Each movie is available for 14 days after you purchase it, with 24 hours to view each movie. You’ll have the option to stream it (if you have the bandwidth) or download it for local playback. (I have personally rented a few of the movies from Microsoft, and the streaming was smooth and uninterrupted. However, I ran into a bug when I downloaded a local copy on a Surface Book, then tried to play it back over a miniDisplayPort-to-HDMI cable. The audio mysteriously vanished after trying to adjust the display output. I simply re-rented it on another device and streamed it. Microsoft didn’t say that it was making its additional day of deals available for Cyber Monday, but it certainly must have factored into its decision. Check out the other Cyber Monday deals we’ve rounded up.